The K-5 program uses the Finding God series by Loyola Press. This curriculum helps children recognize the presence of God in the sacraments, in their communities of faith, in their experience of God's creation and in their lives as people for others. At each grade level, children learn about Scripture and Church teaching through the following units: God, Our Creator and Father; Jesus, Our Lord and Savior; The Church, Our Community in the Spirit; Sacraments, Our Way of Life; and Morality, Our Lived Faith. Click here for an overview of the content of the Finding God program. The middle school program uses the curriculum, Catholic Connections for Middle Schoolers by St. Mary's Press. This program fosters the faith of young adolescents and helps them to make connections between the Catholic faith and everyday life. Click here for more information about Catholic Connections. 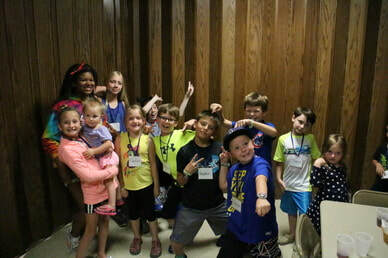 Children in the both programs participate in a variety of activities throughout the year that help them learn more about our Catholic way of life, provide service and have fun. Such activities include helping with liturgical roles at Mass, leading Stations of the Cross during Lent; collecting and sorting food for the Thanksgiving and Christmas food baskets; attending diocesan events such as the junior-high youth rally and deanery ski trip; and joining in the fun of family bingo night. ​Registration. Registration fees are $30 per child. Fees will be waived if a family is experiencing financial difficulty. Click here to register. Schedule. K-8 sessions are held in the church hall on Sundays from 9-10:15 a.m. Click here for a schedule. Cancellations. Please listen to KNIA 1320 AM/KRLS 92.1 FM or check their website for weather-related cancellations, which will be made by 7:30 a.m. for the K-8 program. Handbook. The faith formation handbook contains general program information, sacramental preparation guidelines, discipline procedures and safety guidelines. Find it here. Children should arrive no earlier than 15 minutes before the start of a session and should be picked up promptly after the session ends. Parents dropping off children should pull into the first driveway of the church parking lot, drop off their children, and then exit the lot through the second driveway. All children must enter the building through the hall doors (not the front church doors). Because the K-8 session ends at the same time people are arriving for Mass the parking lot will be busy. For safety reasons parents MUST come into the hall to pick up their K-8 children at the end of each session; children will remain in the hall until a parent picks them up.